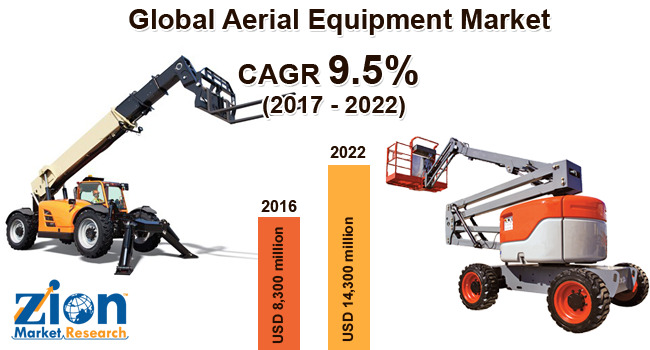 The major market participants in the aerial equipment market are Aerial Access Equipment, Altec Industries, Grove, Elliott Equipment Company, JLG, Haulotte, MEC Aerial Work Platforms, Linamar, Manitex International, and others. These players are set to power the development of aerial equipment market in the near future. The Global aerial equipment market was capitalized at almost USD 8,300 Million in 2016 and is likely to cross more than USD 14,300 Million by the end of 2022, developing at a CAGR of 9.5% from 2017 to 2022. The augmenting construction industry all over the world has powered the construction equipment sector income thus adding up to the development of the aerial equipment market. Stringent government regulations and labor laws, development in the construction sector, and strict adherence to human security concerns are some of the other reasons boosting the development of the global aerial equipment market. In addition to this, different innovative activities by major players are set to power the development of aerial equipment market. For example, in January 2018, surging Permian Basin from West Texas continues to include new drilling activity, thus powering the aerial equipment market. Zion Market Research’s research analysts at in their major research concluded that the rapid development of the construction equipment rental market in the future is likely to unlock potential avenues for the aerial equipment players in the global aerial equipment market. The global aerial equipment market is divided based on the technology, product, end-user, ownership, and the geographical regions. Scissors lifts are employed usually in the aerial working platforms adding up for a primary share in the aerial equipment market. The requirement for the installation applications and maintenance has elevated at a rapid pace, thereby powering the demand for the scissor lifts and boosting the aerial equipment market growth over the years to come. Moreover, the operational advantages that are provided by the scissor lifts drive the product demand as well as aerial equipment market growth. The vehicle-mounted lift ruled the type division in terms of income due to the new product innovations and the technological enhancements. In terms of volume, vehicle-mounted lifts grabbed almost 50% share of aerial equipment market in 2016. The rapid development of construction equipment rental market in the future is likely to generate potential avenues for the aerial equipment players in the global aerial equipment market. The requirement for rental equipment is increasing in the construction sector all over the world due to lack of investment, thus boosting the aerial equipment market.